Corpsing is a technique for transforming a skeleton or skull prop into a corpse by adding tissue, ligaments, veins, or other anatomical details. This tutorial will cover some of the basic techniques we used when corpsing several skulls for one of our projects. First you need to decide what style of corpsed prop you want to create. This usually depends on cause of death, timeline, and environmental conditions. A skull that has been soaking in a swamp for 3 months will look quite a bit different than one that has been mummifying in a desert for 20 years. Once you have picked a basic style you can determine color pallet, textures and materials. The materials you will need depend on the style of the prop you will be creating. 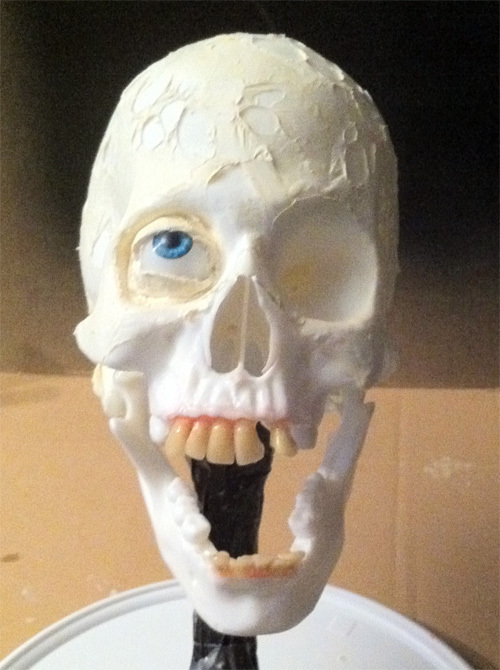 This example will cover a basic skull in the mid-to-late stages of decomposition, with teeth and a single eye. Cyanoacrylate glue – AKA Super glue, Zap-a-Gap, etc. Sculpting tool, pallet knife, or popsicle stick. The preparation phase will differ from model to model. 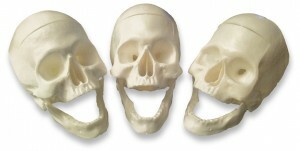 This example is based on the Lindberg pirate skull model, which comes in several pieces. Much like anatomical skull models that are used for education, the Lindberg skull comes with a removable top and detailed cranial cavity. Because we are building an intact skull, we will need to glue the top portion of the skull down. Cyanoacrylate glue is ideal for this task. Lightly coat both surfaces and clamp them together for 5-10 minutes. If you do not have proper clamps for this step, you can manually press the two parts together for a few minutes. While the top portion of the skull sets, you can glue the nasal bone in place. When the Lindberg model is cast, a number of seam lines are formed on the surface. These lines run along the zygomatic bone (cheek bone) and along the outer edges of the jaw. Take a medium grit sandpaper or file and remove these lines, as well as any seam lines that are visible where the top of the skull was attached. To insert the acrylic denture teeth, you will need to take a hand-held rotary tool and drill out sockets for each tooth. 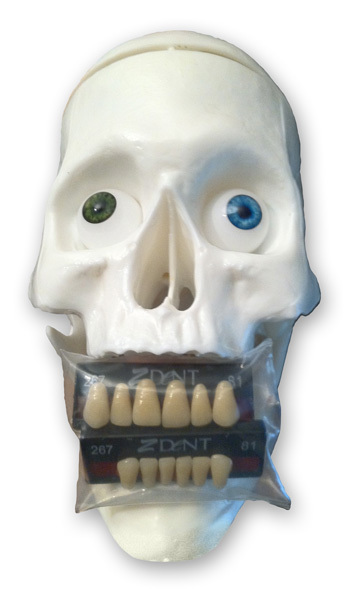 Even if you plan on leaving a few teeth out, drill out each socket so the jaw will appear more natural. Make sure you wear proper eye protection while using a rotary tool. Before gluing the teeth in place, roughen the base of each tooth with sandpaper. This will help ensure a strong bond. You can use a cyanoacrylate glue to attach the teeth, but for this step I prefer a 5-minute epoxy. As the epoxy cures, you can adjust the alignment of the teeth to create what ever effect you desire. You may want an accurate/natural bite pattern where each tooth lines up properly, or you may want to have some teeth missing or at odd angles. Before the epoxy fully cures you can texture the surface of any exposed epoxy by blotting it with a paper towel. This will create a more organic look by roughening the surface and embedding small fibers. Once the epoxy has cured, you can use a grinding tool to chip and wear away the teeth for the appearance of an aged skull. You can also drill into the teeth to create cavities. One of our projects for 2011 was a custom Plague Doctor mask. Because we have received so many questions about the construction of this mask, we have decided to release a tutorial that covers the basic steps for creating such a mask. When starting a new mask, we first need to know the basic dimensions of the actor’s head. Normally, a life cast of the actor would be used during this process so the final product would be a perfect fit. In this case, we constructed a simple head form based on a series of measurements of the actor’s head. 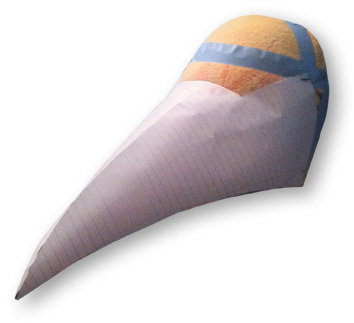 On top of this head form, we constructed a paper prototype of the mask. 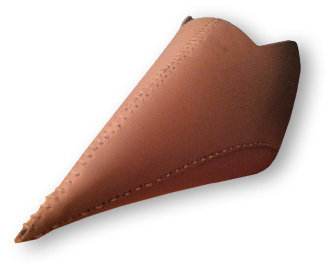 During this process, the prototype is trimmed and shaped to give both the desired appearance and a snug fit to the head form. Once the prototype is finished, it is flattened and cut into templates for the various sections of the mask. The resulting template sections are traced onto the mask material and cut out. While this mask is intended to look like aged leather, we constructed it out of a light-weight foam material that is both easy to work with and comfortable for the actor. This foam material is readily available in 12″x18″ sheets in a variety of colors at most hobby and crafting stores. The material is given the appearance of aged leather with washes of acrylic paint. After the individual pieces for the mask base have been cut out, we stitched them together. First, the pieces were temporarily glued together using hot glue. Once the pieces were assembled, a soldering iron was used to punch holes along the seams for stitching. This method melts and hardens the foam where each stitch will be placed. The hardened material functions like a grommet to add strength/tear resistance, and adds to the aged look. Next, a heavy gauge sewing needle was used to stitch up the seams with hemp twine. Hemp was selected for its strength, natural appearance, and ability to easily take acrylic washes for aging.